Surging oil production in shale hot spots, like the Bakken in North Dakota and Eagle Ford in Texas, has increased waste of natural gas through flaring, venting, and leaking. 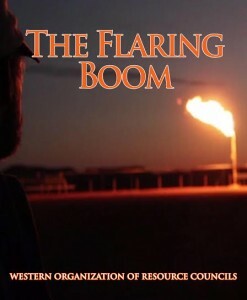 WORC’s report, The Flaring Boom, examines the causes and effects of flaring, venting, and leaking of natural gas by examining efforts to curtail these wasteful practices in Alaska, Colorado, Montana, North Dakota, Texas, and Wyoming. The report identifies three factors spurring the waste. Oil prices are not particularly high, but natural gas prices are much lower. Incentive is too low for companies to spend capital to capture and process gas. Companies want to recoup investments before their leases end. Most oil and gas leases run three to five years. If a company fails to drill and produce within the lease period, it must shell out additional up-front capital. For example, many leases in the Bakken that went for $100 or less five years ago are worth 20 times that, or more, today. Regulation and enforcement are weak in five of the states studied and in federal agencies. The Flaring Boom recommends that oil-producing states adopt Alaska’s flaring regulations. The state prohibits flaring, except for emergencies and system tests. Adopt hard limits on flaring and enforceable deadlines for compliance, and make continued permitting of oil and gas wells contingent on compliance. Require companies to pay full royalties to all mineral owners, public or private, on all oil and gas wasted through flaring and venting. Maintain accurate records of flaring and venting and issue meaningful fines to violators. Review and reconsider air quality laws and rules, including placement of monitors, to develop adequate oversight of temporary oil and gas-related temporary air pollution sources, and to fines to violators.